Apoptosis is a gene-controlled process that leads to the destruction of obsolete, damaged, or pathogen-infected cells. The destruction of the cell is largely achieved by the activation of a group of proteases called Caspases. Caspases are synthesized as dormant enzymes in essentially all cells, their activation is controlled by several interrelated pathways. While the downstream effector components of these pathways are expressed ubiquitously, the upstream pro-apoptotic regulators are regulated at the transcriptional level. The expression of these upstream pro-apoptotic genes acts as the “trigger” for initiating selective cellular destruction (Fig. 1). In mammalian systems, genes encoding BH3-only proteins such as Noxa, Puma, and Bim are the transcriptional targets of P53. 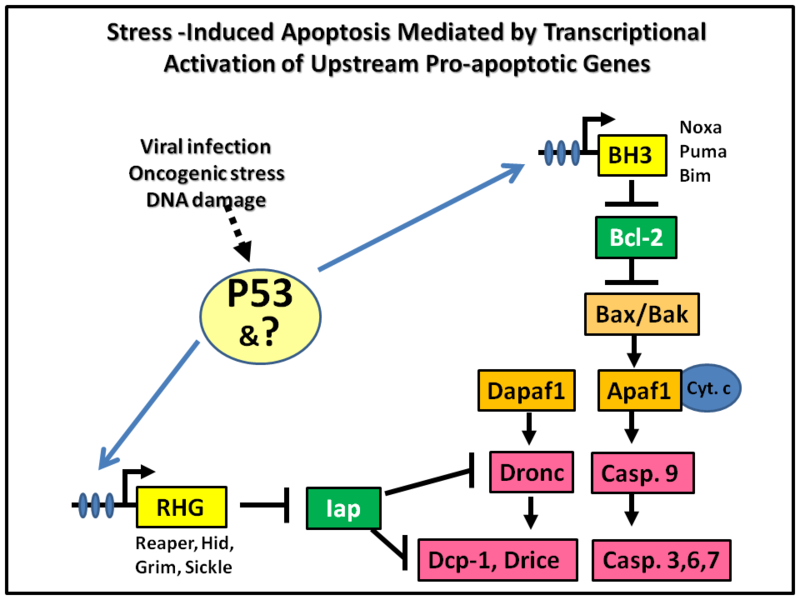 In Drosophila, P53 induces apoptosis through transcriptional activation of the RHG (reaper, hid, grim) genes. 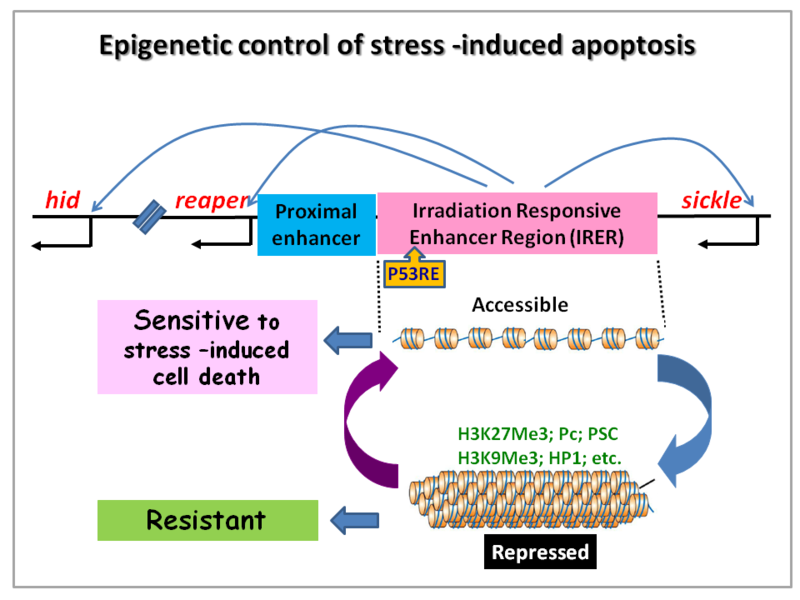 PcG-mediated Epigenetic Regulation Controls the Sensitivity to Stress-induced Apoptosis. Induction of apoptosis in response to oncogenic stress is an intrinsic barrier to tumor formation and development. Cancerous cells need to evade or blunt this mechanism in order to over-proliferate and metastasize. This is underscored by that fact that about 50% of human cancers have mutated P53, which is one of the major sensors of DNA damage and oncogenic stress and a transcription activator of upstream pro-apoptotic genes. On the other side of the token, induction of apoptosis is the underlying basis of many chemo- and radiation therapy. Despite the revelation of key apoptotic mechanisms, we still know little as to what controls the sensitivity to irradiation-induced cell death, which can differ dramatically among different cell/tissue types. Using Drosophila as the model system, we found that epigenetic regulation (chromatin modification) of an ~ 33 kb Irradiation Responsive Enhancer Region (IRER) determines whether the pro-apoptotic genes (reaper, hid, sickle) can be transcriptionally induced in response to DNA damage (Fig. 2)(Zhang & Lin 2008). When this region is masked by “repressive” histone modifications, it becomes inaccessible and renders the pro-apoptotic genes unresponsive to DNA damage signals. To monitor the epigenetic status of IRER in live animals and individual cells, we insertion of an ubi-DsRed reporter via homologous recombination. This reporter revealed that IRER is closed in most post-mitotic cells but the epigenetic status of this region is sensitive to environmental stress as well as nutrient levels. Further work is planned to unravel the mechanisms that control the epigenetic status of IRER. These include the mechanisms initiate the Polycomb group (PcG) -mediated histone modifications in IRER, the boundary elements demarcate the enhancer region of suppressive histone modification (Lin et al 2011), and mechanisms that de-repress IRER in response to stresses. Rapid Induction of Apoptosis as An Innate Immune Mechanism Against Intracellular Pathogens in Arthropod Vectors. Bioinformatics approaches have been and will remain an integrated part or our research in trying to understand systematic regulation of apoptosis. We have used customized bioinformatics strategies to identify pro-apoptotic regulators that are highly diverged during evolution (Zhou et al 2005; Zhou 2005), as well as developing a strategy for identifying conserved regulatory modules (Meng et al 2007; 2008). Current projects in this area include identifying cis elements controlling the epigenetic regulation of IRER (see above, project 1), systematic comparison of cell death pathways (related to Project 2), and cross genome genetic and epigenetic comparison of stress-responsive pathways.